There are various image editor application available in the market that allow users to quickly edit and add watermark to images stored in the computer. Easy Watermark Studio is another image editor application for Windows that is designed to help photographers in adding digital watermark such as text, image, logo, effects, output settings, and etc to the photo. With watermark, there is more safety and assurance that the photos can be protected from unauthorized use. Easy Watermark Studio Pro supports batch mode which allows users watermark a large batch of images in one go. Besides that, Easy Watermark Studio also combines 7 types of image watermark color effects and supports 29 types of image formats like JPG, BMP, TIFF, GIF, PNG, and etc. Create rounded image corner with really smooth edges and image reflections. Sinus transformation and Pixel filters (jitter, circle, grid, pixelize, noise …). Protect photo independent of their formats. Apply filters drop shadow, outher glow, alpha transparency. Available setting for position, rotation, margins, opacity, size etc. 29 types of readable image formats and 5 types of writable image formats. Create a Photoshop like watermark. Batch watermark: protect a photo group of any size at a time. Edit watermarks in easy to use graphical interface. Create watermarks from image and text. Save watermark template for future use. Adjust the size of photos. Creating reflection for a better look. 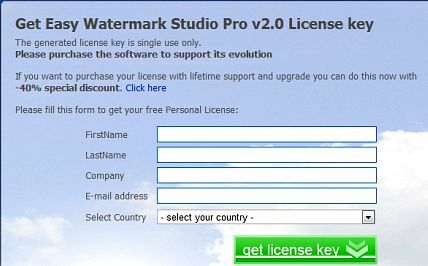 Enter your name, email address, and other information, and then click “get license key” button as shown in below image. An email from “Refero Group” will be sent to registered email containing the registration key for Easy Watermark Studio Pro v2.0. Note: The license key received is single use only. 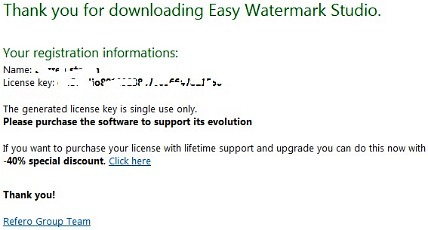 Install Easy Watermark Studio Pro v2.0, and enter the registration key to unlock the program. 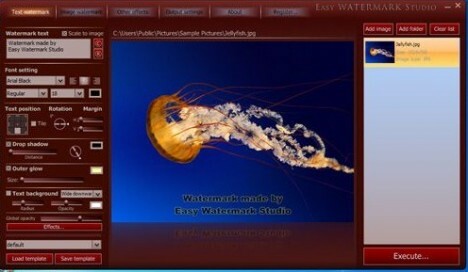 Easy Watermark Studio is compatible with Windows 2000, 2003, XP, Windows Vista and Windows 7.